Boca West Country Club is a world-class country club community located in beautiful Boca Raton, FL. Ranked the #1 private club in Florida, as well as the #1 private residential country club in the country, this extraordinary community sits on 1400 acres of pristine property in West Boca Raton. Boca West also happens to boast the largest number of residents and members compared to other South Florida country clubs, making it one of the most popular and famous clubs in all of South Florida. 54 distinct villages make up Boca West Country Club, offering a variety of choices for homebuyers, including townhomes, quaint garden homes, patio homes, mid-rise condos, single-family homes, and charming villas. All of the villages within Boca West were creatively designed, possessing their own unique charm and flair. Residences in Boca West vary greatly in size, ranging from 1,000 to over 9,000 square feet of luxurious living space. Cedar Glen includes one- and two-story detached single-family homes with three to four bedrooms, private pools, Spanish-style roofs, and two-car garages. The Island, known as the "Jewel of Boca West," is a private gated enclave made up of twelve custom-built homes that range from 6,500 to over 9,000 square feet and feature multi-car and golf-cart garages, lavish pool areas, and immaculate views of the incredible golf course. Fairway Oaks includes 220 attached patio homes that range in size from 2,000 to 3,000 square feet. Each home offers a private pool, a two-car garage, and an open floor plan with vaulted ceilings and skylights. These are but a few of the distinctive villages within Boca West; though they are diverse and each offers unique benefits, all of the villages within this exquisite community are surrounded by open green spaces, colorful plantings, and pristine lakes, providing a picturesque atmosphere for its residents. Membership at Boca West provides the utmost elegance and sophistication that anyone could hope for in country club living. Boca West is known for its professional, courteous staff, who are always willing to go above and beyond to exceed member expectations. 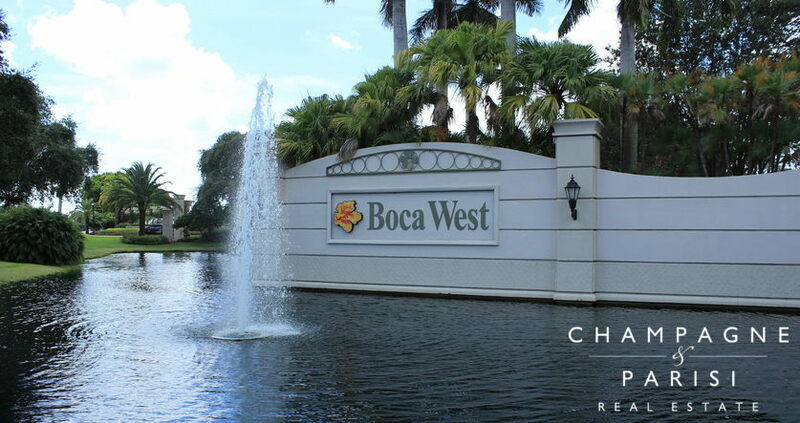 Boca West is perfect for those seeking an active, yet luxurious, South Florida lifestyle. Pete Dye, Jim Fazio, and Arnold Palmer, some of the most successful names in golf course architecture, designed all four of the 18-hole championship golf courses at Boca West. Each course was specifically designed to ensure that golfers of all levels are adequately challenged. In addition to the world-class courses, members enjoy several other golf facilities, including the individual golf pro shops, the driving range complete with 50 tees, and the 4-acre short game practice area, which is great for sharpening up your technique. The Boca West tennis center was recently recognized as the recipient of the USTA Outstanding Facilities Award. This spacious facility features 31 Har-Tru clay tennis courts, two of which are lighted for evening play. USPTA professionals are on site and at your service for private and group lessons. Additionally, Boca West has been the proud host of the USTA French Open Wild Card tournament for the past several years. The Grill Room, which specializes in gourmet breakfasts, homemade soups, and delectable sandwiches. Panache, offering carefully created dinners, delicious lunches, and the very famous Sunday brunch. The Steakhouse that not only features USDA Prime selections but also offers every menu item you would hope to find at your favorite upscale steakhouse. If you would like to learn more about Boca West homes for sale or would like more information about any other Boca Raton country club communities, please call us at 561-998-9015. You may also reach us by completing the simple online contact form provided below, and one of our country club real estate experts will be in contact to assist you. We at Champagne & Parisi Real Estate look forward to having the opportunity to assist you in finding your next dream home in Boca Raton, FL. Click here to view all residential communities in Boca Raton, FL.